Just when you thought SUP was the best thing that ever happened to the water-sports world, the first ever stand-up pedal board makes an entrance. As a different take on ‘regular’ stand up paddle boards, the Hobie Mirage Eclipse gives fun a whole new meaning by combining two fantastic sports – cycling and SUPing/Kayaking. 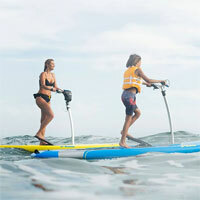 Is stand up pedaling the latest water sport? Well, think of it more like an exciting enhancement to SUPing. You can now cycle on water, literally. The Hobie Mirage Eclipse model is an innovative combination of a feel good work out with a joyous glide across the water. This is one spectacular stand up paddle board, or shall we say stand up pedal board? The Hobie Mirage Eclipse model is an innovative combination of a feel-good work out with a joyous glide across the water. Nothing like the Mirage Eclipse has hit the waterways until the creation of this beautiful and unique stand up pedal-paddle board. The easy to use design is for everyone—from the morning walker or weekend warrior to the active adventurer and exercise enthusiast. This universal paddle board with pedals is a great invention that allows you to take a break from the monotonous gym environment by moving your workout to the water. It provides an all in one core and leg workout, along with experiencing the pleasures of being on the water. It gives you the freedom of determining your own speed. Just as if you were going for a walk, on the Eclipse Mirage you can step slow or rapidly to propel yourself at the speed of your choice. The Hobie Eclipse features handlebars for steering the board. Who would have thought you would ever be able to steer a paddle board without a paddle? This is one of the best parts of the Mirage Eclipse. The aluminum alloy handlebar support is a bonus for maintaining your stance and balance. With easy accessibility for steering, you can maneuver the board accurately in any direction you choose. 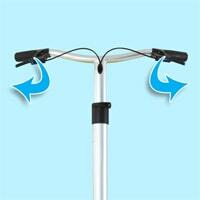 The handlebar option is perfect for getting in and out of tight spaces. Don’t you worry about your kids not being able to reach, because these handlebars are easily adjustable to any specific height. Each handle consists of squeeze levers similar to the breaks on a mountain bike. However, these levers are used for steering. To veer right, you squeeze the right handle trigger, and to go left, squeeze the left. A very easy way to change direction and the Eclipse Mirage turns on a dime. The Mirage Eclipse comes in two sizes and colors; 10’6 and 12’0, both with paint options in either Solar Yellow or Lunar Blue. The vibrant colors make you easily visible which is always a plus when paddling through busy channels or any open body of water. Another great factor to the choice of paint is the reduction of the sun’s harshness. The bright colors reflect rather than attract which reduces the chances of your Hobie SUP fading—a common problem with traditional fiberglass boards. With the proper rinse care and storage, the paint will remain fresh and sharp looking. Both sizes of the Hobie paddle board have the perfect amount of width for maintaining expert stability. You have a solid foundation to rock comfortably when cutting through the chop or rolling over boat wakes with the sleek design of the displacement hull. The board is constructed with an advanced composite epoxy that helps reduce sand and gritty skid damage when pulling up to the shoreline. And don’t worry about damaging the bottom fin thrusts either. When pulling up to shore, they can turn outward to avoid any scraping or bending along the bottom. Find the best size that fits you and the family. It goes from pedal to paddle in seconds. The Eclipse Mirage transitions back into a paddle board in just seconds. 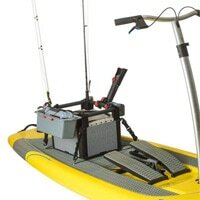 What makes this board stand out from the other pedal and paddle crafts on the market is the detachable handlebars and the easy removal pedal device connected to the fin thrusters. If you feel like your legs need a break or you want to focus on your core strength and switch to paddling mode, the option to remove the pedals and handlebars is all yours. Just don’t leave home without your paddle. Disassembly takes only seconds and is made simple for everyone. The Hobie stand up paddle board has underwater fins that help to propel it and also act as a centerboard for keeping the board upright and balanced. They are attached to the board by inserting each pedal in the full-down position. Your stepping motion cycles the pedals, which in turn propel the fins, helping to glide smoothly on the water. The faster you pedal, the faster you move—and the burn in your legs will make you realize the fitness benefits of the pedal board. The Hobie Eclipse Mirage has a universal phone mount, a cup holder, a bag cover and a wheeled beach cart for easy transport. The accessories are sold separately. There is no reason why you cannot photograph those amazing moments and enjoy a cup of your favorite beverage as you have fun in the water. What Does The Hobie Mirage Eclipse Have To Offer? Why Buy This Stand Up Pedal Board Right Now? So, you like to exercise, fish, and cruise around the bay on a calm sunny day. Well, this is your chance to do all three at the same time. The Hobie pedal board has zero to little sound when in motion, making for a clear and calming serenity on those afternoon calorie burners around the lake or through those backwater trails. There’s nothing like having the opportunity to discreetly sneak up on your favorite fishing hole unannounced and toss a line. With the stealthiness of this bicycle paddle board, the fish won’t even realize your surface presence. With enough space for a tackle box or small cooler behind the pedals, the separately sold H-Crate accessory makes organization on the water a breeze. This durable, light-weight attachment is perfect for strapping down fishing poles, bait buckets, and other fishing tackle with its bungee devices. You’ll easily be able to stay organized and quickly re-tie or re-rig fishing lines if you’re in a rush to fight your next keeper. The Hobie Mirage, complicated as it may seem, is actually very easy to set up and launch. Learning to use a SUP board is a bit difficult and you end up spending more time in the water than on the board at first. Not so with this elliptical paddle board. Using it is as easy as stepping on the board and going. You need very little effort and it is very hard for you to fall off—not to mean that it is impossible though. This pedal board also moves very smoothly in the water and it is convenient for every family member. The Hobie Mirage Eclipse has the added advantage of transforming into a SUP within seconds. Money is important and if you can find ways to save it, the better. Instead of buying a SUP, which costs almost as much as a pedal board, just buy the pedal board. You can always change it to a SUP when you feel like paddling—no loss. As you approach the shoreline, the rudder folds up to protect the blade from any damage. This translates to the durability of your blade. This has got to be one of the most amazing features of the Eclipse pedal board. It is a relief to the forgetful or inexperienced riders. This bike paddle board does have a few extra pounds added to it with the addition of the pedal and handlebar attachments. So it is easier to set up your rig near your intended drop-in location rather than carrying it all at once in one attachment. Also, working as a team to carry the set up makes for easier transportation to and from your vehicle, and can even save you time. It is a bit costly. The Hobie Mirage Eclipse price may be too high for some people. SUPs have never been on the cheaper side. However, this pedal board is worth its weight in gold, given the numerous features and the promise of a great outdoor experience. Also, as mentioned above, you get to have a pedal board and a paddle board all in one. You have to buy the accessories separately. Since the pedal board is a bit expensive, Hobie should at least make one or two accessories inclusive. But for whatever reason, they do not. This means extra expenses. Anyway, most of those extras are luxuries and you will do just fine without them. You can always buy them later. It does not work many body muscles. After spending time pedaling on the leg powered paddle board, it is mostly your legs that will feel the burn. Some of your body muscles will not even feel a thing. Nonetheless, you can always switch to SUP to work your core and arms adequately. There is no losing with this board. The board is not big enough for two or more people. It can only accommodate one person at a time. Nonetheless, if you would like some company, there is enough space to tag your dog along so you do not have to be all alone on the water. The customer reviews for the Hobie Mirage Eclipse are not many- which is expected because it is still a new, unique product and it costs a little too much for some people. Those that have tried this pedal board love it so much, they cannot get enough. Cyclists who have a love for water sports are probably the happiest people when it comes to this board. According to the customers, this bicycle of the seas offers a fun way to enjoy the water while working your leg and arm muscles, just as though you were cycling on the road. The stability and smoothness of the pedal paddle board do not go unnoticed. Regardless of your skill level and body size, this board will keep you afloat. 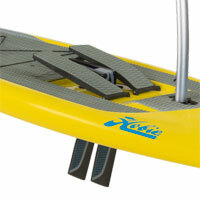 Users have also commented how the rudder folds as they approach the shore, enhancing the durability of the blade. Another lovable feature is the fact that the handlebars, rudder and pedal system fold for storage and transport. Finally, riders appreciate the silence of this leg powered stand up board. They can peacefully enjoy serenity on those days when they just want to pedal as they reflect or clear their minds. It has also proven to be quite useful when fishing—sneaking up on fish has never been this fun. It’s obvious the Hobie Eclipse Mirage is an outstanding, all-around first choice pick for a great work out and enjoying a day out on the water. The creation of the standup pedal-paddle board is the beginning of something new in the sport of SUP and will always stand out as something exciting and unique. How often do you get to combine two amazing sports? The stability of this water paddle board will keep various risks at a minimum, especially if you go paddling with kids or your dog. The adequate space also allows you to carry snacks, water and other necessities to keep you comfortable in the water for longer. Honestly, if you come to think of it, the price of the Hobie Mirage Eclipse is justified. If the price is far above your means, look for a used one. Buy the Hobie Eclipse Mirage right now, and be the first of your friends to own this amazing stand up pedal paddle board. You are sure to love it. To see the Hobie Mirage Eclipse in action, watch these two videos to see what this stand up pedal board is fully capable of. Check out the stand up pedal board prices on the links below the videos.